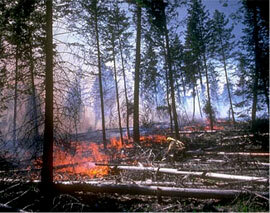 Fire has been a natural occurrence in forests throughout history. According to the US Forest Service, four out of five wildfires are caused by people. Wildfires can start during dry summer months from natural causes such as lightning strikes and can also be started by human causes such as motor vehicles or escaped campfires. Although you can’t eliminate every threat of fire, you can take steps to create a fire resistant home and landscape. If your home is on a forested property, fire resistant building materials are the best protection against fire. Studies show that the portion of a home most vulnerable to wildfire is the roof. Roof your home with nonflammable roofing materials. Use a simple hip or straight gable roof design when building in a wooded area. Keep your roof, gutters, and deck free of debris during the dry season. Store fire wood and lumber at least 30 feet away from your home. Non-combustible exterior wall materials such as stucco, cement board, or masonry can lower fire risk. Choose fire resistant materials for deck construction. Create fire barriers by wrapping decks that are higher than 24 inches from the ground with nonflammable siding. 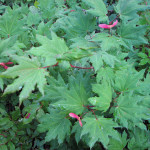 Vine maple is fire-resistant – remember, though, being fire-resistant does not mean it will not burn! 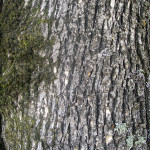 Oregon white oak (Quercus garryana) has thick, fire-resistant bark. Younger trees are more vulnerable. The plants in the landscape near your home can also add fuel to the fire, literally. Plants with resinous, oily, waxy, or aromatic foliage contain compounds that can increase the intensity of a fire. Examples include sage and juniper. Plant selection, placement, spacing, and maintenance are crucial to creating a fire resistant landscape. Locate groupings of plants so that at their expected mature size there is at least 10 feet of clear space between plants and from structures. This will prevent fire from spreading across planted areas. Prune back tree branches within 10 feet of walls and roofs. Trim limbs of coniferous trees that are within 30 feet of structures so that none of the limbs are closer than 6 feet from the ground. This reduces the chances that a ground fire can spread into the canopies of your trees. Maintain plants so that they are free of deadwood and litter. Remove plants that are diseased or infested. Dispose of debris away from structures and natural wooded areas. Avoid using bark mulch near structures. Rake ground covers such as bark mulch, wood chips, compost, and tree litter away from flammable structural components of your home. Even though ground covers generally only smolder, homes can be damaged by a creeping fire which can ignite structural components. Remove invasive, nuisance plants, and prohibited plants from your landscape because they can be highly flammable and can serve as “ladder” fuels. This includes European hawthorn, Himalayan Armenian blackberry, Scot’s broom, English holly, and English ivy. If you do not water the lawn through the summer season, or if seasonal water shortages call for a temporary end to irrigation, let your lawn turn brown and then cut your grass as low to the ground as possible. Learn more about invasive plants. Leaves are moist and supple. Fire-resistant plants do not readily ignite from a flame or other ignition sources. These plants can be damaged or even killed by fire, however, their foliage and stems do not significantly contribute to the fuel, and therefore, don’t add to a wildfire’s intensity. Most deciduous trees and shrubs are fire resistant; however, both native and ornamental plants can be highly flammable. Select native plant species that are naturally fire resistant. These plants require little maintenance and provide a relatively low volume of total vegetative fuel load. Our Native Plant Database has information on many kinds of native trees and shrubs, including several fire-resistant kinds!